It’s a liiiiiittle past midnight as I’m writing this post here at Otaku Ohana Mobile HQ, a room here at the Ala Moana Hotel with a lovely view of the yacht harbor between the Hawaii Prince Hotel and another building, the name of which I wouldn’t be able to tell you without Googling it first. Yup. 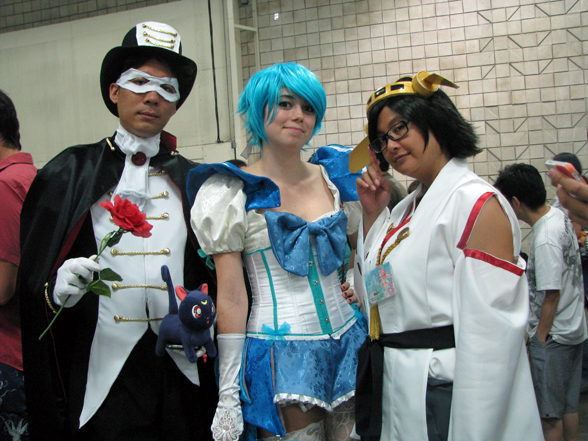 It’s definitely Kawaii Kon time again. 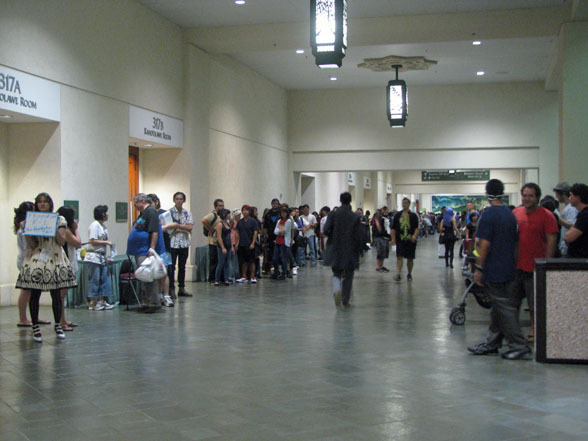 Here’s my traditional Day 0 “look at how many people who preregistered and showed up to pick up their badges on Thursday!” picture. And here’s my usual “Yay! I have my credentials! 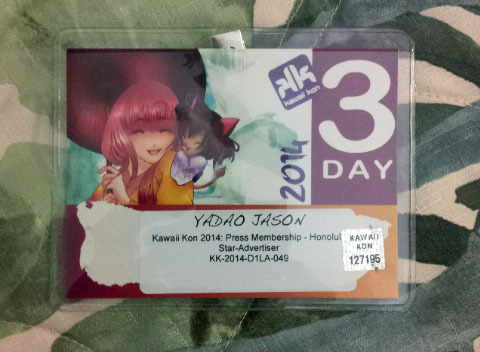 MY EXISTENCE IS VALIDATED” picture of what my press badge this year looks like. Here’s the cover of this year’s program, full-color and glossy. Here’s are two pages of the guest list. 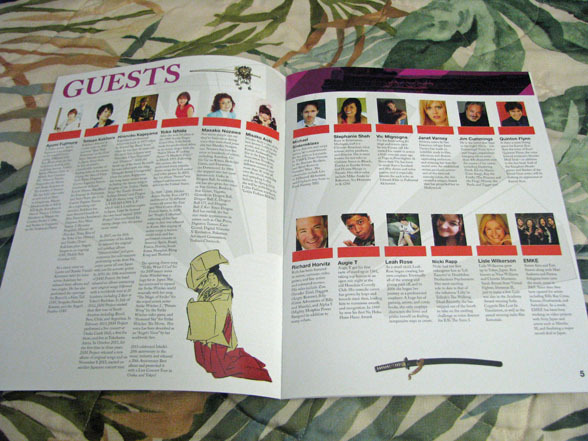 Not shown but also in the program: no one, because these are all the guests that are at this year’s show. 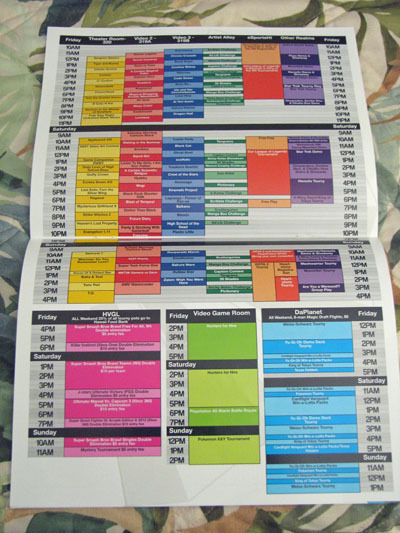 Here’s the con’s full schedule of events for Friday, Saturday and Sunday… not counting the video screenings, which are on a second two-page spread. Each page of this year’s program measures 8-1/2-by-11 inches, which means this year’s schedule would have taken up half of the 2005 program. 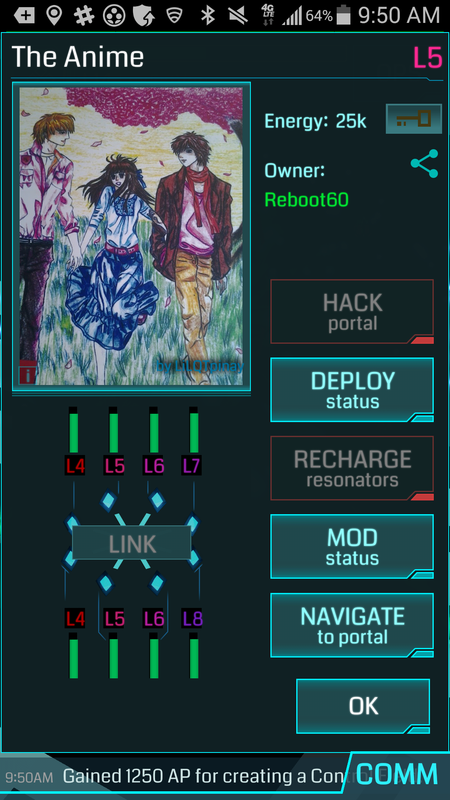 And for fun? 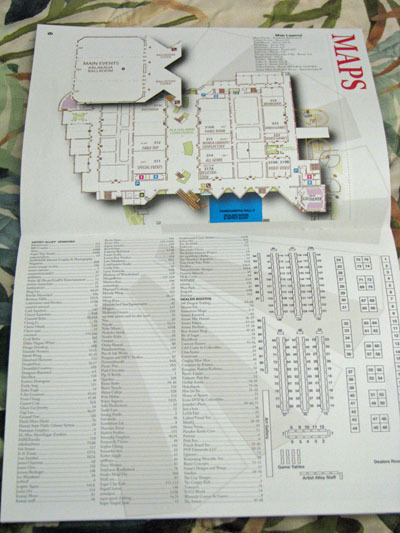 Here’s are this year’s maps of where everything is located in the Convention Center and in the newly expanded, ground-floored Artist Alley/Dealers Room exhibit hall. If I’m already achy from walking all around Ala Moana Center and to and from the Convention Center, you can pretty much guarantee that my legs will fall off by the time Kawaii Kon is over. Yes, kids, getting older is as awful as they say. Hachi Maru Hachi is back with issue #3, and it’s their biggest issue yet — four stories over more than 150 pages. Tara Tamayori’s ongoing series, “Eternal Blade,” is joined this time by three new stories: “Death in Numbers” by Kaci Horimoto, “Refraction” by Caitlin Slattery, and “You’re Not Alone” by Jonathan Pinches. Pick up your copy at Artist Alley table 78. 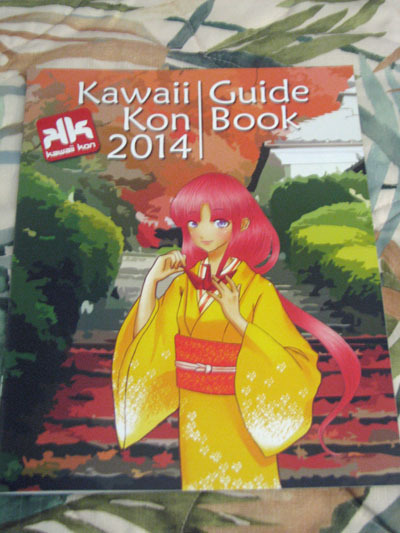 If you can’t make it to Kawaii Kon, order a print-on-demand version at www.createspace.com/4562129. 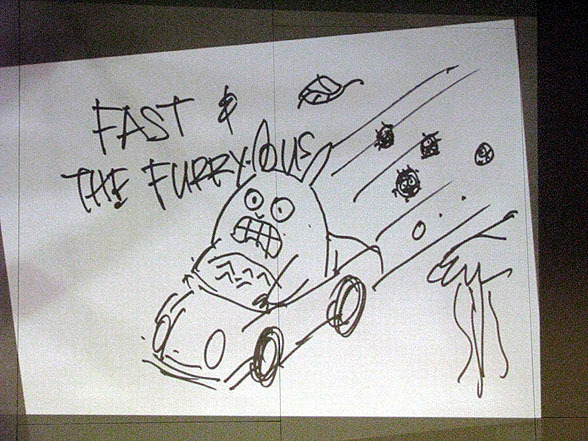 nemu*nemu artist Audra Furuichi will be selling original sketch cards featuring her interpretations of characters from Ghibli films — somebody better buy that Totoro card before I do! — and the hot anime of the past season, Kill la Kill. Find them in the Dealers Room, booth 51. 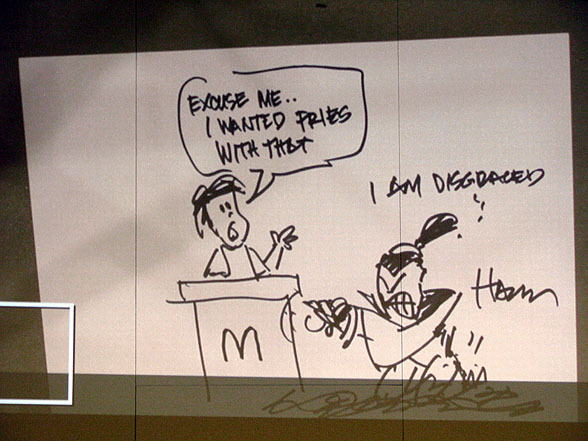 Speaking of original sketches, Comic Jam Hawaii coordinator Michael Cannon will be selling original sketch bookmarks of characters from anime, other cartoons and comics — somebody better buy that Yuki Nagato bookmark before I do! 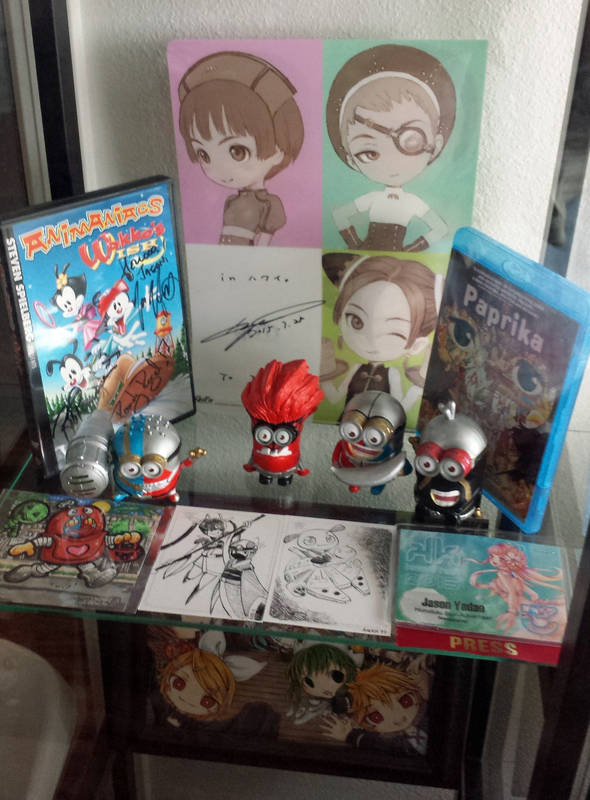 (Alas, this is the classic quandary of yours truly, the anime blogger who wants to save money yet buy everything he promotes.) Find him at Artist Alley table 57. Artist Kevin Sano has been known in the past for great-looking prints of characters from tokusatsu (live-action Japanese superhero) days like Kikaida, Hakaida and Kamen Rider V3. 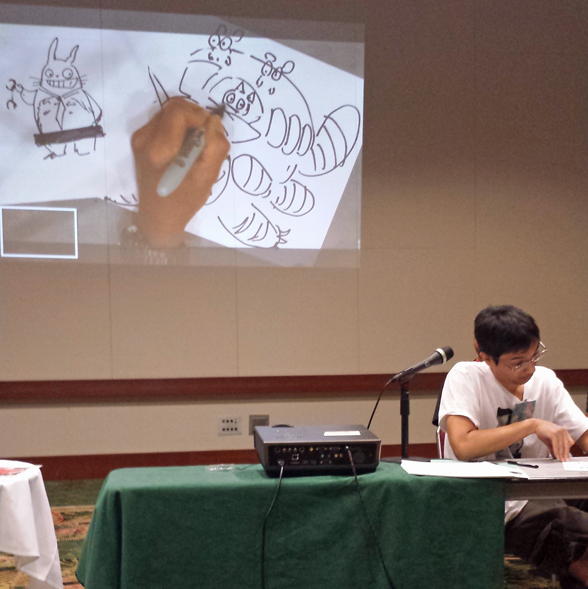 but the last two times I’ve seen him, at McCully-Moiliili Library’s Mini Con and Oni-Con Hawaii, he’s brought several Kikaida Minions, toys of those adorable yellow Despicable Me characters all painted up in tokusatsu gear. To your right, you can see his latest batch that he’ll have this weekend. 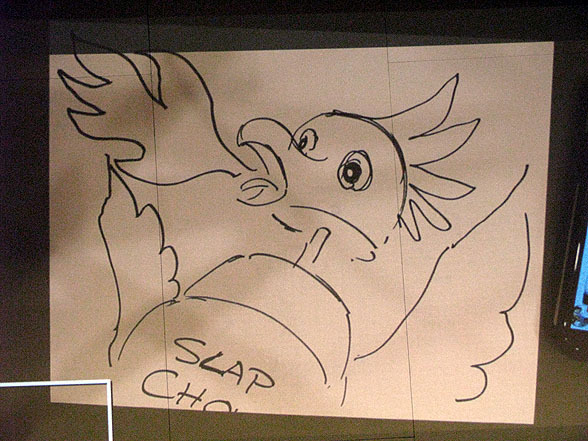 Have your drool buckets handy, people. Find him at Artist Alley table 100. 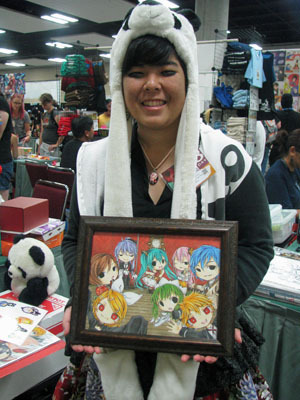 Erika Engle is at Artist Alley table 14. Yes, that Erika Engle. She’ll be selling handmade jewelry with her daughter, Cassidy Gravitt. 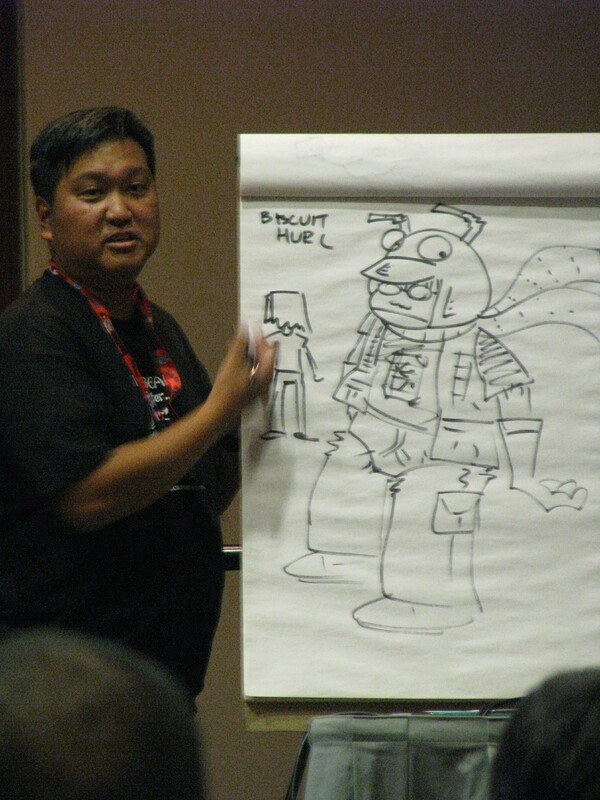 If you remember my highlights roundup from my article in Thursday’s paper, you’ll recall that I mentioned that Stacey Hayashi, author of the “Journey of Heroes” graphic novel about the 100th Battalion and 442nd Regimental Combat Team, would be hosting a panel at 3:30 p.m. Saturday. 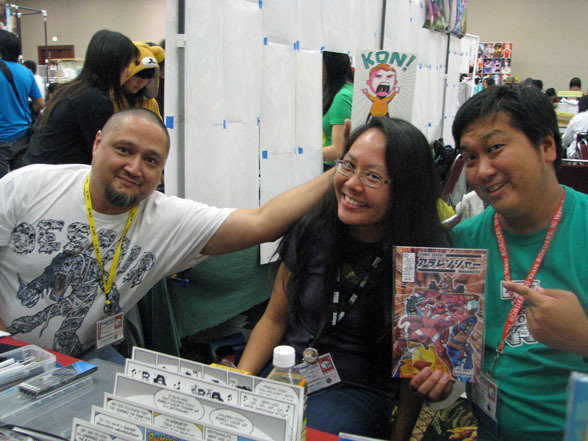 What I didn’t mention was that (a) she’ll be bringing 442nd vet Eddie Yamasaki with her to that panel and (b) she’s also going to be selling books, shirts and chibi soldier kokeshi dolls in Artist Alley. She’s splitting space with Smurphy Graphics, so you can find her at Artist Alley tables 90 and 91. Those of you of a certain age may remember Jon Murakami’s first published comic strip “The University of Diverse City,” published in UH-Manoa’s paper of record, Ka Leo. This year marks 25 years since it was first published in 1989, and to celebrate, Jon’s produced an 11-by-17-inch print that features that landmark first strip, both as it first appeared in Ka Leo and a freshly redrawn version that shows how it would’ve looked had he drawn it today. Find him at Artist Alley table 58.